It’s quite exciting to see many field recordists and sound designers eager to begin sharing sound fx with the community. I receive many emails from people curious about selling sound. Writing about sharing field recordings on the Web is one of my favourite article topics. However, as the site grows larger, those posts are a bit trickier to find amongst the other articles. How do I sell sound effects? How do I create a sound fx library? How do I design a sound effect library? Those are all good questions. So, it’s time for a refresher. Today’s article is a roundup of all previous posts about sharing sound. 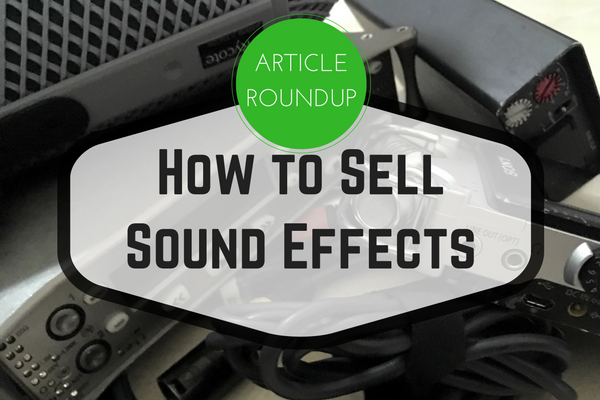 Let’s look at the scope of selling sound effects first. Then I’ll share links that address the ideas in detail. Brainstorm 10 sound fx library ideas. Browse what people are sharing already. Use the Sound Effects Search search engine for research. Use this info to come up with either a fresh idea or a completely new spin on an existing one. Gather the audio. Record sounds for the very best topic of your ten choices. Include many variations (e.g., distance, perspective, performance). Record as many sounds as you can. Edit and master the tracks. Polish the audio to remove all problem sounds and production audio. Keep only your very best work that you are absolutely proud of. Trash the rest, or save those clips for your private sound library. Name or add metadata to the sound fx. This gives the library a boost, looks professional, and cuts it away from the competition. Assemble your “support files.” Create bonus files such as text lists, images, an audio preview montage, user licenses, and so on. Share your sound library on a distributor’s website in return for a percentage of your sales. Options include “independent sound fx library bundle shops" such as Sonniss, A Sound Effect, and Wild Track Sound Library. There are also "a la carte" shops like Sounddogs that sell clips one at a time. Build your network. Create accounts for the social media of your choice: SoundCloud, Twitter, Facebook, etc. Join groups, and comment on forums. When you launch, share your library in these places. How to Create an Indie Sound Bundle. This post describes how to create a package of sound effects in the spirit of an independent sound fx library. Selling Sound Checklist – What You Need to Share SFX Online. A checklist of things you need to include with your sound library. How to Create an Irresistible Sound Library Preview. Ideas for creating a tantalizing sound library audio preview montage. How to Protect Sound Library Samples. Ideas for ensuring your sound library isn’t stolen. 6 Mistakes You Want to Avoid When Selling Sound Effects (part 1, part 2). Important, minute details to be aware of when deciding to sell sound on the Internet. There are dozens of ways to share sound on the Web. Mostly, though, it is split between two options: selling them yourself, or allowing a distributor to share them for you. These posts explore those options. An Introduction to Indie Sound FX Web Shops. A summary of ways to sell sound fx on your own website. How to Choose Where to Sell Sound Effects (part 1, part 2). Tips for choosing a sound library distributor website. 11 Ways to Improve Your Sound FX Store. Concrete suggestions on how to improve your sound effects store. 10 1-Minute Fixes That Drastically Improve Your Indie Sound FX Library. Quick tips that will instantly improve your sound library. How to Share Your Sound Effects Library Safely. Ideas for protecting your sound library and Web shop. Includes links to a copyright primer. How To Build a Viable Sound Effects Library. Tips for choosing a good subject for a sound library. How to Build an Irresistible Sound Library To Evade Competition. Advanced tips for creating impressive sound recordings. How to Take Your Sound Effects to the Next Level. A five-point checklist for improving any sound effect. 3 Changes That Will Improve Your Sound Library. Considerations for increasing the impact of your sound collection. Why Small Changes Can Amplify Your Sound Library. Explains why knowing your audience improves your sound effects. Two Things You Must Know When Creating a Sound Library. Describes how focus and knowing your audience improves your sound clips. Selling Creative Sound. How to create impressive sound effects and sell them in the best shops on the Web. This books is meant for people who want to sell sound clips on someone else’s website. It requires just a bit of effort and is usually a good way to begin sharing sound. Sharing Sound Online. How to build your own indie bundle sound library and sell it from a Web shop you build yourself. This book takes sharing sound fx to the next level. It has ideas for building indie sound fx bundles, and tips for sharing sound on your own website. Next roundup: Sound FX Library Ideas and How to Choose Them.